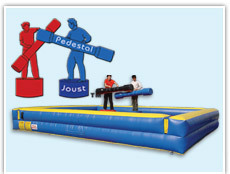 The Pedestal Joust inflatable game offers plenty of straight-up jousting. Secure safety walls and added protection that only comes with an inflatable game. Players can challenge each other as they each climb up onto their own pedestal, using oversized inflatable joust poles to try and knock one another to the game floor. With an eye-catching red, blue, and yellow color scheme, this inflatable jousting game will attract attention and keep guests lined up to get their shot at pretending to be an iron-clad jousting knight.